Consumer Action trainer Linda Williams visits the The Louisiana State University Agricultural Center, known as the LSU AgCenter, to give a money management workshop using our MoneyWi$e materials. Linda Williams (center) at the MoneyWi$e training she facilitated at The Louisiana State University Agricultural Center. 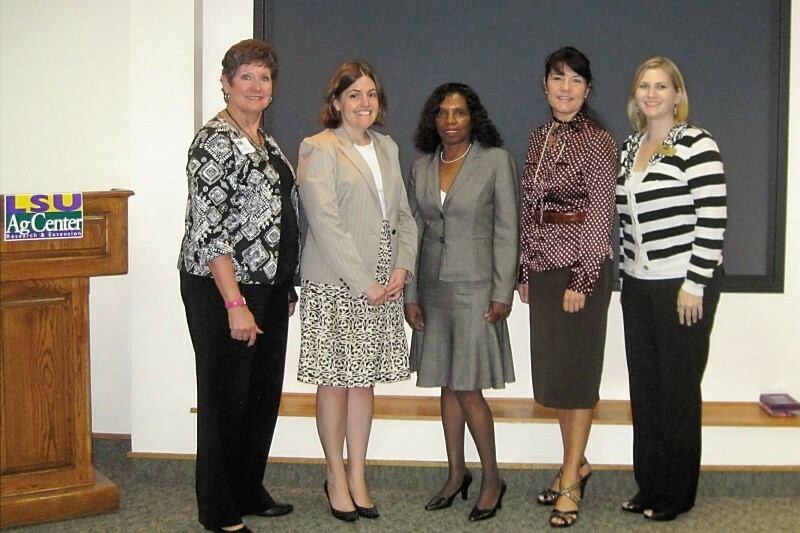 With Williams (L-R) are Jeanette Tucker, Lauren Bartlett, Nancy Montoya and Valerie Vincent of LSU AgCenter. “To repair your credit report, you’ll need to avoid overspending and cut expenses, clean up your credit file, open a bank account and try to avoid credit repair companies,” Linda Williams said at a recent money management workshop. A community outreach manager with Consumer Action in Los Angeles, Williams presented information on ways to prevent identity theft, rebuild your credit, protect your accounts from fraud and expand home ownership. Williams, who has been with her agency since 2006, has a long history of fighting for low-income residents. She said Consumer Action is a non-profit, membership-based organization that was founded in San Francisco in 1971 and has served consumers nationwide by advancing consumer rights. “Consumer Action works with legislators, community organizations and the media to inform, advise and advocate for consumers,” she said. Her presentation at the workshop sponsored by the LSU AgCenter, Consumer Action and Capital One Bank dealt with the importance of building personal credit and ways to avoid the headache of identity theft. She also discussed the damage that can be done by someone stealing your identity. “Not only do you need to get a copy of your credit report, but supplemental reports like medical records, rental records and your check-writing history can all be helpful in avoiding identity theft,” she explained. Williams said people should check their credit reports regularly. Individuals can get free copies of their reports from each of the three major credit reporting agencies every 12 months at the Annual Credit Report website www.annualcreditreport.com. Robin Betts, manager of the Home Ownership Center for Mid-City Redevelopment Alliance in Baton Rouge, said the meeting provided useful information on the learning styles for adults that will help in presenting money management information. Betts said her office had been counseling about 10 foreclosure clients during a six-month period. Now they are exceeding that number every 30 to 60 days. The meeting, dubbed a MoneyWi$e Financial Literacy Roundtable, was designed to build the capacity of financial educators and community agencies to provide financial education to the public, particularly underserved populations, said Jeanette Tucker, an LSU AgCenter family economist. Tucker noted the U.S. financial system has grown increasingly complex. Valerie Vincent, LSU AgCenter Family and Consumer Science regional coordinator, said the idea for the workshop came from attending a consumer action conference in New Orleans last year, and she realized that the information should be shared with her community partners. “With the LSU AgCenter’s current budget situation and the loss of some agents, we felt it was important to get this information to our partners and invite them to help us to get the word out to our clientele,” Vincent said. The meeting included local bankers, Louisiana Partners for Home Ownership Education, Home Ownership Preservation Task Force members, an attorney and a representative from the Federal Reserve Bank in New Orleans. “These people are here to increase their knowledge and to help serve their communities in a role to help us because we are not able to reach the consumers we have in the past,” Vincent said. She said the volunteers will help by going into schools, churches and community organizations to teach the information they learned at the workshop. This article is used with permission of The Louisiana State University Agricultural Center (LSU AgCenter) and its author, Johnny Morgan. For more information on how the MoneyWi$e program is being used at LSU AgCenter, contact Valerie Vincent, LSU AgCenter Family and Consumer Science regional coordinator, at 985-839-7855.